ROYAL CANIN Medium Puppy Dry Dog Food is both scrummy and nutritious! Growth is an essential stage in your puppy’s life, it’s the time of big changes and new discoveries. Because your puppy’s immune system is still developing gradually, a specially tailored diet will help your puppy get all the nutrients it needs to grow healthy and strong. 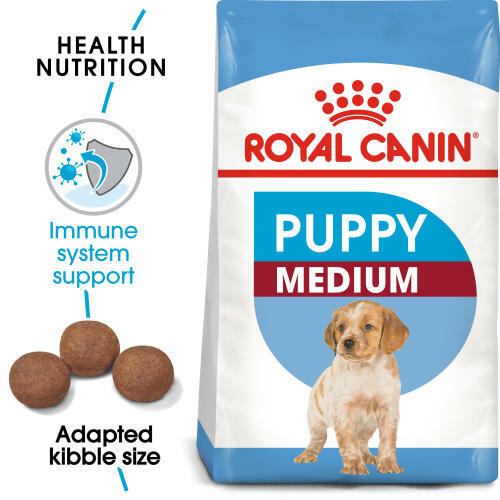 ROYAL CANIN Medium Puppy food is suitable for puppies between 2 and 12 months old that will have a medium-sized adult weight between 11kg to 25kg. ROYAL CANIN Medium Puppy food contains an increased protein content to help support healthy, muscular, and skeletal growth during the relatively short growth period. Antioxidants are included to support your puppy’s natural defences which can be a particular challenge during this life stage. The combination of nutrients containing high quality prebiotics and protein in ROYAL CANIN Medium Puppy food helps to support and maintain your puppy’s general digestive health. A group of proteins (L.I.P.) known for their high digestibility have also been included for optimal digestive support. Immune system support - Growth is an essential stage in your dog’s life: it is the time of big changes, discoveries and new encounters. During this key period, the puppy’s immune system develops gradually. MEDIUM PUPPY helps support your puppy’s natural defences thanks particularly to apatented* complex of antioxidants including vitamin E. *France, patent No EP1146870. Digestive health - Combination of nutrients with high quality protein (L.I.P. *) and prebiotics (FOS) to support digestive health and balance of intestinal flora, which contributes to good stool quality. *Protein selected for its very high digestibility. Short growth high energy content - Meets the high energy needs of medium breed puppies which have a short growth period. Additives: Vitamin A: 16000 IU, Vitamin D3: 1000 IU, Vitamin E: 520 mg, E1 (Iron): 45 mg, E2 (Iodine): 4,5 mg, E4 (Copper): 14 mg, E5 (Manganese): 59 mg, E6 (Zinc): 123 mg, E8 (Selenium): 0,08 mg - Technological additives: Clinoptilolite of sedimentary origin: 10 g - Sensory additives: Yucca extract: 125 mg - Preservatives - Antioxidants. * L.I.P. : protein selected for its very high digestibility. Composition: Dehydrated poultry protein, maize, animal fats, beet pulp, vegetable protein isolate*, maize gluten, dehydrated pork protein*, rice, wheat flour, hydrolysed animal proteins, wheat, maize flour, minerals, fish oil, soya oil, yeasts and parts thereof, fructo-oligo-saccharides (0,34%), hydrolysed yeast (source of manno-oligo-saccharides), yeasts extracts (source of betaglucans), marigold extract (source of lutein). Crude ash: 8%. Crude fibre: 1.7%. Crude oil fats: 20%. Moisture: 0%. Protein: 32%.